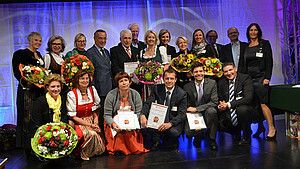 The award winners of the Kinderseelenhilfe sponsor certificate 2013. At the centre the Wenatex founders Sonja and Hans-Gerd Wernicke. 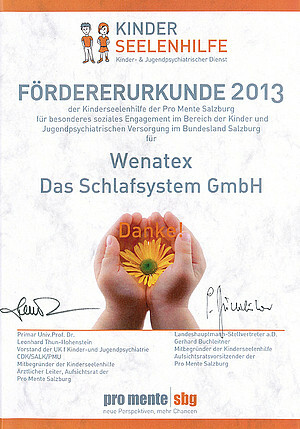 As a sponsor of the Salzburg Kinderseelenhilfe, Wenatex was awarded a certificate of honour by Pro Mente at the Promenteus award ceremony. Wenatex has been commited to supporting Pro Mente and Kinderseelenhilfe child welfare organisation for many years and, among other things, they also contributed toward the acquisition of the “Bubble-Truck” in 2010. The “Bubble-Truck” was used by psychiatrists so that they could offer mobile services to children and adolescents in towns around the province of Salzburg. Around 25,000 children and adolescents in the province of Salzburg are either mentally ill or are in dange of suffering mental illess. The Kinderseelenhilfe organisation with its mobile therapists is an important contact point for those youngsters, because the waiting list for therapy is extremely long, especially in mountainous regions. A commitment toward social projects is for Wenatex ownes Sonja and Hans-Gerd Wernicke an integral part of social responsibility, which one bears as an entrepreneur. However, supporting the Kinderseelenhilfe and the long-term collaboration with Pro Mente is a concern of the heart that goes beyond mere responsibility. “Mental illness is still oftern regarded as a tubu subject in our society. With our commitment we also want to make a contribution toward breaking with this taboo.” explains Sonja Wernicke.